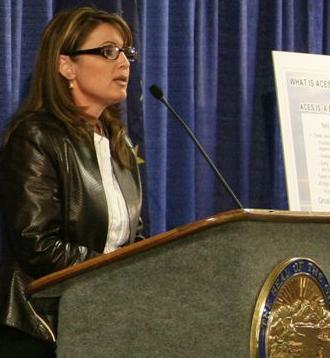 Sarah Palin has slumped in poll ratings since she became the target of SNL skit of Tina Fey. Perhaps it has broken her spell and could decide the next president. Three weeks from now, Sarah Palin may be the Vice-President elect of the United States of America. But today, few people would call her the most powerful woman in American politics. Probably the most influential woman in America is probably Tina Fey – a television comedienne. Since Palin’s nomination as Republican John McCain’s running mate for the White House, Tina Fey has mercilessly and relentlessly impersonated her on NBC’s late-night satirical show Saturday Night Live (SNL). The physical resemblance of Tina Fey to Sarah Palin is very strong and uncanny. The female comedienne has an equally spooky knack of replicating the Alaska governor’s near-Canadian accent. Fortunately, The Republican presidential nominee took Tina Fey’s mockery in a good part but Palin’s poll ratings seemed affected and appeared to have devastating result. In a Newsweek poll in September, voters were asked whether Sarah Palin was qualified or unqualified to be president. The result was a near dead-heat. In the same poll this month, those saying she was “unqualified” outnumbered those saying she was “qualified” by a massive 16 points. Some of Fey’s best satire has come straight from Sarah Palin’s own unforced errors. At the end of last month, Sarah Palin was interviewed by Katie Couric, the main news anchor for the CBS television network. Katie Couric asked the vice presidential candidate whether the $700 billion for the Wall Street bail-out, which had at that point not been approved by Congress, might be better spent helping out middle-class families. That babbling response was a gift for Katie Couric, but an even bigger one for Fey the following Saturday. Repeating Sarah Palin almost verbatim gave Tina Fey her most powerful line so far. Thanks to Fey, SNL has gained more viewers. While other television shows continue to lose viewers, its ratings are up 50 per cent this autumn – despite the fact that it is now in its 34th season. It currently commands 10 million viewers – a creditable figure for a prime time drama, let alone a late-night sketch show.